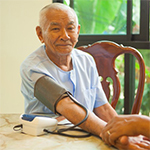 MONDAY, May 23, 2016 (HealthDay News) -- Fluctuations in blood pressure may be linked to faster declines in thinking skills among seniors, a new study suggests. Among older patients, those whose systolic blood pressure -- the top number in a blood pressure reading -- varied between doctor's visits showed more rapid mental deterioration and loss of verbal memory than those whose blood pressure stayed within normal ranges, researchers found. Variability in the bottom number -- diastolic blood pressure -- was also associated with faster decline of mental ability among those aged 55 to 64, but not among people aged 65 and older, the study authors added. "The relevance of blood pressure variability between doctor's visits has been dismissed until recently," said study author Bo Qin, a postdoctoral associate at Rutgers Cancer Institute, in New Brunswick, N.J.
"However, over the past six years, evidence has accumulated that blood pressure variability over monthly or yearly visits may lead to greater risk of stroke and some additional health problems," she said. This study suggests that it may not be a random phenomenon or an unimportant measurement related to use of blood pressure medications, "but may instead provide information relevant for prognosis," Qin said. According to Qin, this study cannot prove that fluctuations in blood pressure cause declines in mental ability, but it adds to mounting evidence that these changes in blood pressure may have health consequences. "Higher long-term variability in blood pressure readings predicted faster declines of mental function among older adults," Qin said. "Controlling blood pressure instability may be a potential strategy in preserving mental function among older adults," she suggested. The report was published online May 23 in the journal Hypertension. For the study, Qin and colleagues collected data on nearly 1,000 adults aged 55 and older who took part in the China Health and Nutrition Survey over five years. Blood pressure was calculated from three or four visits to health professionals. Participants also completed a series of mental quizzes, such as word recall and counting backwards. "Although the study was done in China, the same results apply in the U.S.," said Dr. Gisele Wolf-Klein, director of geriatric education at Northwell Health in Great Neck, N.Y.
"The correlation of fluctuation in blood pressure and dementia is known to be linked to circulatory problems -- specifically to high blood pressure," she said. But high blood pressure and low blood pressure may both be damaging to the brain, she added. The goal is to try to achieve a stable blood pressure rather than have huge variations. "You want good, solid, stable, average numbers," Wolf-Klein said. Keeping blood pressure within normal ranges may help "prevent dementia and may even benefit patients who are losing their mental abilities," she said.